Hooters Casino Hotel, just east of the Las Vegas Strip, is home to a namesake Hooters restaurant and, of course, the world-famous Hooters Girls in tiny orange hot pants and white tank tops. But it offers so much more. Not only is there an array of scantily clad ladies, but Hooters Casino Hotel also has a little something for everyone. The resort’s comfortable rooms are island-casual with tropical prints on the comforters and all the standard amenities. The casino is always packed with action and includes table games like roulette, craps and blackjack as well as plenty of slot and video poker machines, a poker room and a William Hill sports book. Cocktails are available throughout the resort — in spots like Pete & Shorty’s. Eating options include Hooters restaurant, featuring the “nearly world-famous” buffalo wings. Mad Onion Fine Food & Spirits is great place to enjoy a fine dinner. The décor is contemporary and the restaurant also boasts an intimate lounge. 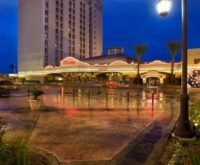 Hooters Casino Hotel’s hospitality extends out to the resort’s pool area. Open 24/7, there are two tropical themed pools and a waterfall. Hooters Girls are also there to serve you a cold beverage at the pool bar. Best of all, no one has to leave empty-handed. While the Hooters Girls have to stay behind, true fans can bring home a piece of the resort from Splurge, a shop that sells all sorts of Hooters Casino Hotel logo merchandise and memorabilia.